* These ready-to-play 60-card decks showcase some of the best spells that green and black Planeswalkers have in their arsenal. 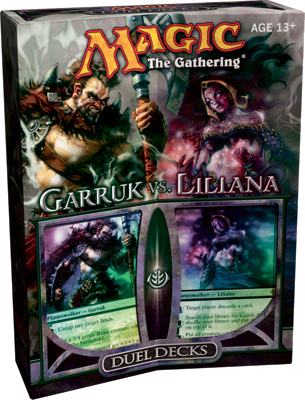 * Duel Decks: Garruk vs Liliana has eight rare cards, and six cards with new artwork, including foil alternate-art versions of Garruk Wildspeaker and Liliana Vess. * Each of the cards in the 60-card decks will be black-bordered and tournament legal. This means that these cards are legal for use in any tournaments where the original printings are still legal.